It is the goal of the administration to use ICT as a key to facilitate good governance, strengthen accountability, increase transparency and improve operational efficiency of government offices to deliver quality services and make information available to the people. One of the expenditure priorities in FY 2013 is the digitization of financial processes and frontline services in the government. This year the national budget opts to continue the digitization efforts of the administration. The E-Government Fund for FY 2014 is strategically designed to create interoperable ICT systems that are coherent with the 5 Key Reform Areas (KRAs) of the Aquino Administration and will foster better collaboration among government agencies. It is aimed to create a bigger impact in terms of public service delivery and efficiency of civil servants. The E-Government Fund shall support the current ICT-driven initiatives of the government. 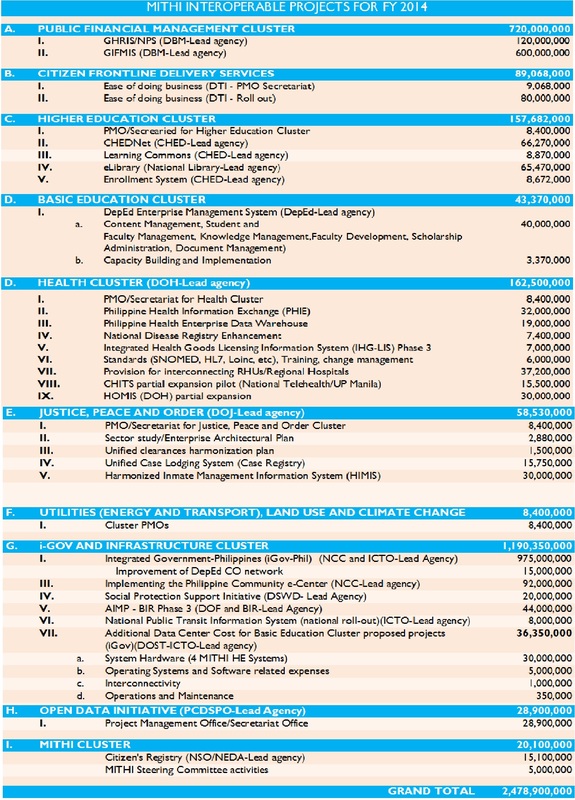 The E-Government Fund this increased from the P 1B allocated for FY 2013 to P 2.48 B this FY 2014. Through the Medium-Term Information and Communications Technology Harmonization Initiative (MITHI) the government was able to identify the challenges in the strategic sectors and recommended priority projects that will address these challenges.